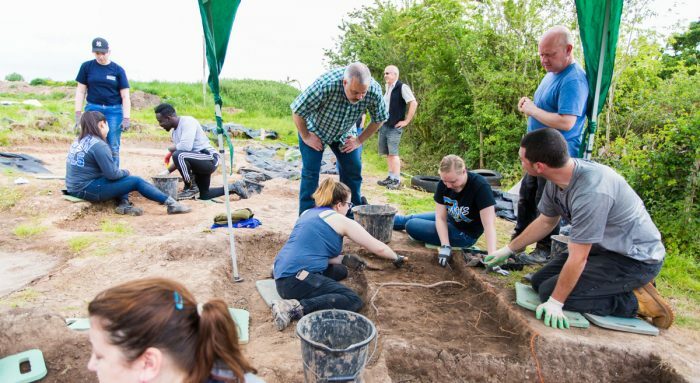 Home Tags Posts tagged with "joint degree programs"
In a bucolic, rural setting not far from the town of Chester, England, a group of Southern anthropology students worked meticulously to unearth the remains of men, women, and children buried centuries earlier in unmarked graves. The Poulton Research Project has yielded the largest amount of medieval bones from the years 1066 to 1485 to come out of English soil. And for the eight Southern students who joined peers from partner institution Liverpool John Moores University at the site during a two-week field study this May, it provided an opportunity that can’t be replicated on this side of the Atlantic. “We’re uncovering human remains from the Middle Ages, finding out how and why they were buried that way, and trying to figure out how these people died — it’s a great way to learn,” said Jarod McAnern, a Branford sophomore. The chance to participate in an archaeological field study abroad was one of the things that drew him to the Anthropology Department, and to Southern, he said. 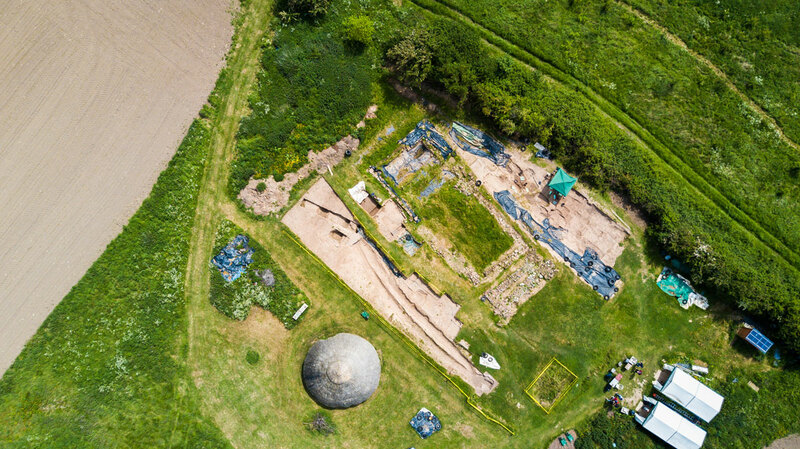 McAnern and his fellow students uncovered medieval pottery and coins, along with the skeletal remains, while learning to survey, document, and photograph the burial sites and perform forensic testing in the labs at LJMU. 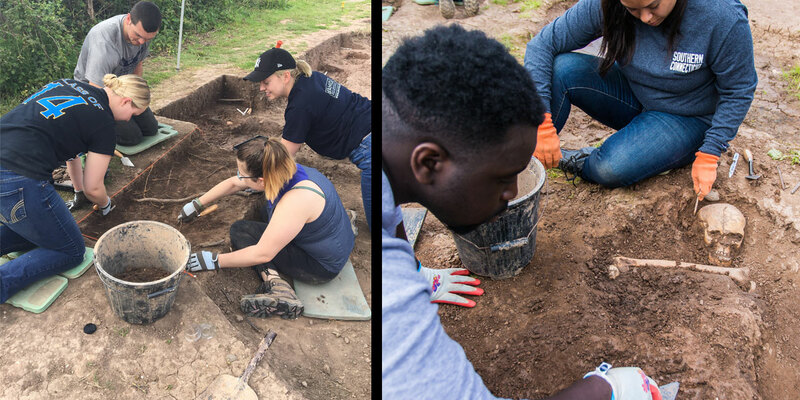 “Instead of these students doing simulated field work in a lab setting, they’re getting real-life experience in one of the most significant archaeological sites in England,” said Anthropology Department Chair Kathleen Skoczen, who led the SCSU group. The field study represented another development in the blossoming Trans-Atlantic Alliance between SCSU and LJMU, which in its third year has included research internships, study abroad for students from both institutions, faculty exchanges, and the approval of the first programs in a portfolio of joint master’s degrees. Entering the third year of the partnership, SCSU and LJMU are focused on expanding its reach. Already this summer, 20 LJMU students spent three weeks at Southern as part of a cultural immersion experience. In Iceland, 35 students and four faculty members from both institutions engaged in a field-based exploration of the interrelationships between the economy and the environment. Projections are that more than 20 students will spend a semester abroad in Liverpool in spring 2018, while more than 30 LJMU students are expected to make the reverse crossing during the 2017/18 academic year. Research and teaching collaborations have been under way, or are planned, in more than 15 disciplines, ranging from creative writing and art, to public health and computer science. A giant step forward will see the launch of two joint master’s programs — projected for the fall of 2018: an M.S. in coastal resilience, under the umbrella of SCSU’s Department of Environment, Geography, and Marine Sciences and its LJMU counterpart, and an International Master’s of Business Administration, offered by the respective Schools of Business. Pending approval by the Connecticut State Colleges and Universities (CSCU) Board of Regents, two additional jointly delivered master’s degrees will launch in the following academic year: an M.S. in global health, and another master’s degree focusing on recreation, tourism, and sport management. Other potential shared graduate programs in creative writing and anthropology are in the pipeline. The addition of these programs would place SCSU and LJMU in rarified territory as the only American/Anglo universities offering more than one joint master’s program. And these new offerings, built on a hybrid platform of online courses combined with time on the ground at both institutions, would be a draw for an international pool of students, senior leaders said.